The human shoulder complex is perhaps the most complicated joint in the human body being comprised of a set of three bones, muscles, tendons, and ligaments. Despite this anatomical complexity, computer graphics models for motion capture most often represent this joint as a simple ball and socket. 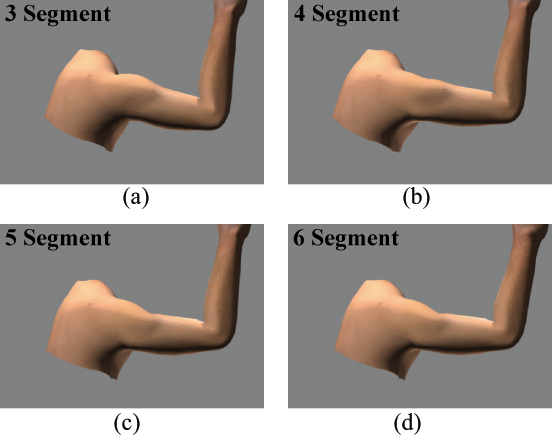 In this paper, we present a method to determine a shoulder skeletal model that, when combined with standard skinning algorithms, generates a more visually pleasing animation that is a closer approximation to the actual skin deformations of the human body. We use a data-driven approach and collect ground truth skin deformation data with an optical motion capture system with a large number of markers (200 markers on the shoulder complex alone). We cluster these markers during movement sequences and discover that adding one extra joint around the shoulder improves the resulting animation qualitatively and quantitatively yielding a marker set of approximately 70 markers for the complete skeleton. We demonstrate the effectiveness of our skeletal model by comparing it with ground truth data as well as with recorded video. We show its practicality by integrating it with the conventional rendering/animation pipeline. "A Data-driven Segmentation for the Shoulder Complex"
The documents contained in these directories are included by the contributing authors as a means to ensure timely dissemination of scholarly and technical work on a non-commercial basis. Copyright and all rights therein are maintained by the authors or by other copyright holders, notwithstanding that they have offered their works here electronically. It is understood that all persons copying this information will adhere to the terms and contraints invoked by each author's copyright. These works may not be reposted without the explicit permission of the copyright holder.